I have been using Facebook’s React since v0.9.x in Feb 2014. I am a defector from Backbone.js which initially started after replacing our view layer with React. After understanding the benefits of Flux and it’s unidirectional flow architecture it became pretty evident that I did not need Backbone.js models and collections anymore. I will assume you have some basic knowledge of Flux, Redux, React, and functional programming. I will cover as much as I can in this article. Dan’s Redux library is so compelling and simple that I believe almost anyone can build non-trivial front-end web applications. But I had to know how he made this work under the covers. I started my exploration into the Redux source code. In order to understand this source code you have to be pretty familiar with functional concepts to get through it. The code is very terse and it could be very hard to read without some foundational knowledge. I will attempt to guide you through a lot of these functional concepts which include function composition, currying, and applying high-order functions. I encourage you to read through this source code to demystify how reducer functions are created and aggregated, how action creator functions can be simplified by wrapping them with the dispatch method, and how to add middleware capability to the default dispatch method. This article should help you understand some of the Redux framework code, strengthen your understanding of functional concepts, and get exposure to some ES6 syntax. Middleware sounds much more complicated than it really is. The only way to really understand middleware is to see how the existing middleware works, and try to write your own. The function nesting can be intimidating, but most of the middleware you’ll find are, in fact, 10-liners, and the nesting and composability is what makes the middleware system powerful. Middleware is created by composing functionality that wraps separate cross-cutting concerns which are not part of your main execution task. It is likely that you have used middleware already if you have experimented with Koa.js. My first encounters with middleware was when I was programming Java Servlet Filters and Rack with Ruby to address cross-cutting concerns like authentication, authorization, logging, gathering performance metrics, or some other decoration before the main execution of the task is handled. In this small amount of code there are tons of functional concepts littered in here including high-order functions, function composition, currying, and ES6 syntax. I read this about 10 times the first time I saw it and then everything just went blurry :). Let’s touch on a few functional concepts before getting back to this code so that does not happen to you. Before we can reverse-engineer this Redux middleware code you might need a little more foundational functional programming knowledge. You can skip this section if you are already familiar with these concepts. Of course we will want the ability to compose more than two functions together. This was just to illustrate the basic concept. We will look at a more generic way to solve that issue by examining the Redux code. Spoiler alert: This is pretty much all there is to creating middleware in Redux. The store will dispatch this action object to all of it’s reducer functions which could affect state. However, the reducer functions are only concerned with executing logic around this deletion. They typically don’t care who did it, how long it took, or logging the before and after effects of the state changes. This is where middleware can help us to address these non-core concerns. Notice that createLogger accepts the getState method which is injected by applyMiddleware.js and used inside the inner closure to read the current state. This will return a new function with the next parameter which is used to compose the next chained middleware function or the main dispatch function. This function returns a curried function that accepts the action object which can be read or modified before sending it to the next middleware function in the chain. Finally, the main dispatch function is invoked with the action object. A much more robust implementation of logger middleware for Redux can be found here. I blatantly cheated a lot and trimmed down this implementation by making a lot of bad assumptions so I could save time and show the basics. The applyMiddleware function probably could have been named a little better. What are you applying middleware to exactly? I think this should be a little more explict and named something like applyMiddlewareToStore. What else would you be applying this middleware to? The next argument will be a function that is used to create a store. By default you should look at the implementation for createStore.js. The final returned function will be like createStore and replaces the dispatch function with it’s associated middleware. Next we assign the store implementation to the function responsible for creating the new store (again see createStore.js). Then we create a variable to the store’s original dispatch function. Finally, we setup an array to hold the middleware chain we will be creating. Now we create our replacement dispatch function with the information about the middleware chain. There is no obvious way here to dispatch an action that would be returned from the fetch which is Promise based. Plus we do not have a handle to the dispatch function. Therefore, we can use the redux-thunk middleware to defer execution of these operations. By wrapping the execution in a function you can delay this execution. typeof action === ‘function’ ? 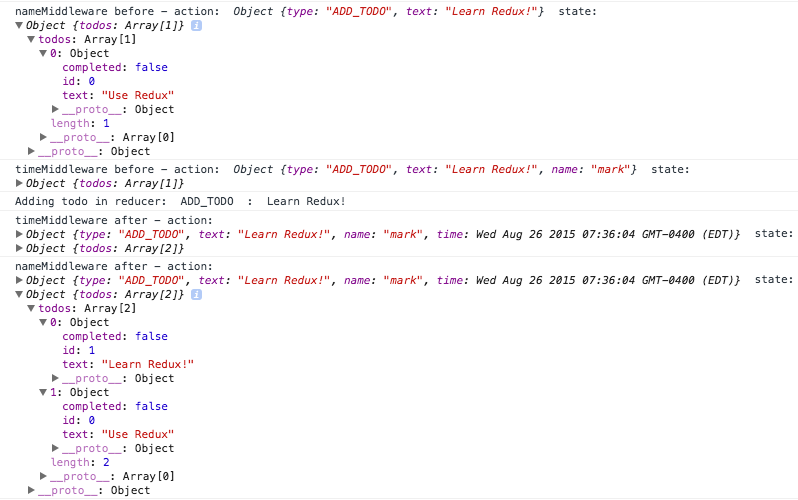 This should be familiar to you now that you have already seen how Redux middleware works. If the action is a function it will be called with the dispatch and getState function. Otherwise, this is a normal action that needs to be dispatched to the store. Also check out the Async example in the Redux repo for more details. Another middleware alternative for working with Promises in your actions is redux-promise. I think it is just a matter of preference around which middleware solution you choose. You now know most of the Redux core source code. Now you will want to check out the react-redux library so you can connect your store to your React views. Hey Underscore, You are Doing it Wrong! — This is more about functional programming and less about Underscore. Hopefully you gleaned enough information to understand Redux Middleware. I also hope you strengthened your foundational functional knowledge. I am constantly trying to get better at functional programming and admit that it is not easy at first. You have to practice this and learn from others to grasp the concepts. If you understand this article you should have enough confidence to invest in more learning. Finally, don’t use other people’s libraries without understanding them first. You need to determine if they are a good fit for your project. A good place to start is by reading the source code. You will likely learn new programming techniques and be able to weed out bad solutions quickly. It is your responsibility to understand the tools you are using before letting them creep into your project.